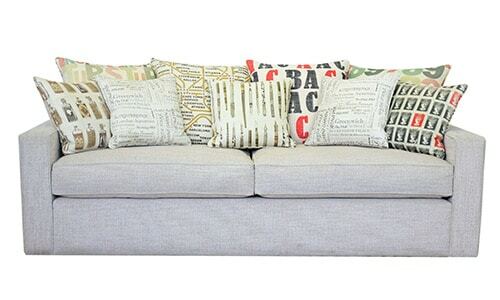 Harvard 4 seater sofa with pillow backs and scatters. Size: 240cm/94″ long x 102cm/40″ deep. Frame and seats Cristina Marrone Mistura. Composition: 85% polyester, 15% acrylic. Severe contract and washable at 40 deg. Mind the gap, ABC, Rainbow Letters, and Rainbow numbers. Red or Black, Penaholic, Drink Me, 2 x The Knowledge. Image displayed shows soft fill seat interiors, feather scatter interiors.